covers, labels, squares of muslin, string. Large preserving pan. through a mincer or chopped very small. Feb only) I always make a double batch. 1 med sweet orange and enough seville oranges to make up to 900g. Pop 2 or 3 saucers into the freezer ready to test for 'setting'. Use sterilised jars and place in the oven to warm. Cut all the fruit in half and extract the juice, using an electric juicer can save a lot of time but if you don't have one use a hand one. Place all the pips and any pith into the muslin and make it into a bag by gathering up the corners. Tie firmly with string. Put all of the fruit skins through the mincer or chop quite small, you only want fine chunks in the marmalade. Place the water, fruit chunks and the juice into the preserving pan and hang the muslin bag into the liquid (you can usually tie this on to the side of the pan). Bring to the boil and simmer gently for about 1½ to 1¾ hours or until the chunks are tender. Remove the muslin bags and squeeze tightly (using two spoons because they are hot) to extract a thick juice which you place in the pan, discard the bags. Add the sugar and on a low heat stir until it is completely dissolved, this is important! Turn up the heat and boil rapidly for 15 minutes initially. Take a saucer out of the freezer and put on a teaspoonful. Leave for a minute or so and then push with a spoon. If the jam 'wrinkles' it is ready, if not boil for another 5 mins and test again and so on. When ready remove from the heat and add a little knob of butter which will disperse any scum. Leave to rest for fifteen minutes. 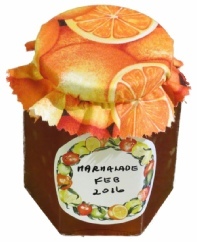 Put into the jars, and when the marmalade is still warm (not hot) place on the wax covers and put the lids on tightly. By doing this while the jam is warm you will get a better vacuum. Cover the jar lids with pretty paper or fabric circles and date label.